The seat of The Dukes of Norfolk and set in 40 acres of sweeping grounds and gardens, Arundel Castle has been open to visitors seasonally for nearly 200 years. It is one of the great treasure houses of England, each having its own unique place in history and is home to priceless works of art. Come and see paintings and furniture, tapestries and stained glass, china and clocks, sculpture and carving, heraldry and armour in stunning room settings. The manor, called Arundel, is mentioned in the will of our great Alfred, and there can be no doubt that in Saxon times a fortress of some sort existed here, since in the Survey of Domesday a castellum is returned at Arundel. At the battle of Senlac, or Hastings, a Norman knight of repute, being a kinsman of Duke William, called Roger de Montgomeri, led the centre of the invading army, and on him, in return for his important services, the Conqueror conferred the two earldoms of Arundel and Shrewsbury, with two of the six rapes into which the county of Sussex is divided to the support of the former dignity, making what was called the Honour or Seignory of Arundel.Earl Roger enjoyed his earldoms for twenty years and built the Norman castle probably adding to and strengthening the old structure which he found. He resided here chiefly, but latterly had to defend his Shropshire lands against the Welsh, when he won for himself the territory still called Montgomeryshire. In 1094 he died an inmate of his abbey at Shrewsbury, being succeeded by his second son, Hugh, who four years later was slain by an arrow while repelling the invasion of Anglesea by the sea king Magnus of Norway. Then his elder brother, Robert, who was possessed of the family property in Normandy at and about Beleme (from whence he derived his name), assumed the titles and lands in England, on payment of £3000 to the Crown. This Robert de Beleme, who won for himself by his cruelty and tyranny an odious name in England, sided with Robert Curthose, Duke of Normandy, against Henry I. who at once went against the earl, leading a strong force against his castle of Arundel, in the absence of Beleme who had gone to build a stronghold against the King at Bridgnorth (q.v.). According to Roger Wendover, Henry sat down before Arundel to besiege it regularly, and constructed against it one of the usual lofty wooden towers for annoying the garrison. The besieged sent to their earl to know what they were to do, and he returned word back that they might make the best terms they could with the King ; whereon the castle was promptly surrendered, and thus passed to the Crown. Then Henry pursued Earl Robert into Shropshire, and besieged and captured his new castle of Bridgnorth, and following him on to Shrewsbury was met by the earl on the way, and received his abject submission. But though his life was spared Beleme was banished and his lands were forfeited, and he died in 1118 a prisoner at Wareham (see BRIDGNORTH and SHREWSBURY). Henry settled the lands and dignities on his second queen, Adeliza, who afterwards became the wife of William de Albini, a baron of Norfolk, the elder son of a Norman companion of the Conqueror of similar name, by Maud, the daughter of Roger Bigod. 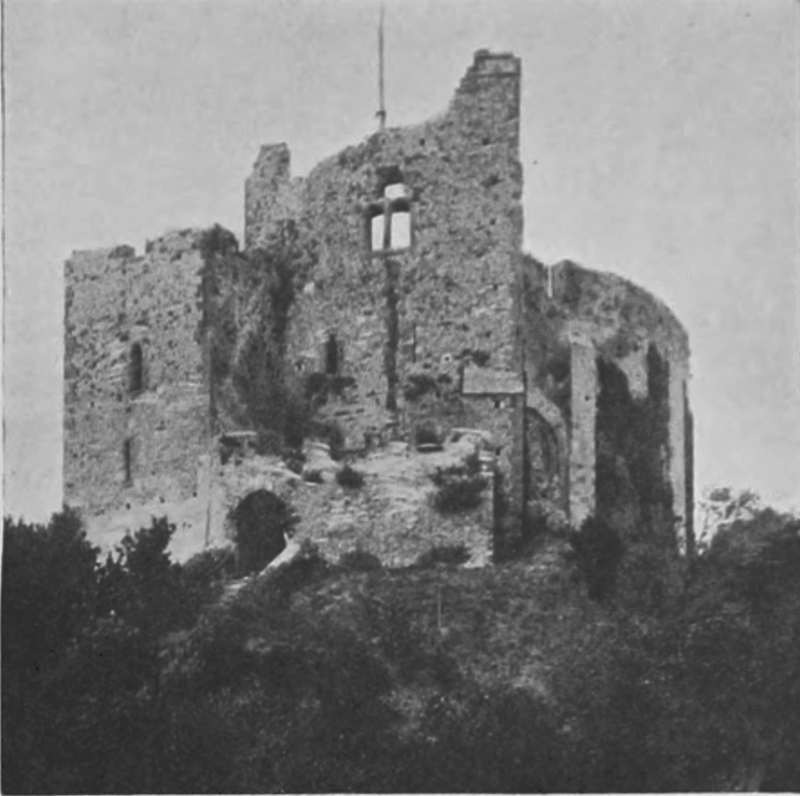 Albini then, jure uxoris, became Earl of Arundel, and as such naturally gave shelter at this castle to the King’s daughter, the Empress Maud, defending her against the usurper Stephen. The Albinis held Arundel till the death of Hugh, fifth earl, in 1243, s.p. male, when the earldom and property went with his daughter, Isabel, the wife of John FitzAlan, son of the Norman baron of the same name, lord of Clun and Oswestre ; and the family of FitzAlan enjoyed possession for above three centuries, till 1580, when Henry, the fourteenth and last Earl of Arundel (who was Dudley’s rival in the affections of Queen Elizabeth), died ; and after him his son died s.p.. Arundel was then inherited by Mary, a daughter of the eleventh earl, who was married to Thomas Howard, Duke of Norfolk ; in that noble family it has continued to the present time, the title of Earl of Arundel being held as the dignity of the eldest son. The castle has sustained three sieges : the first, when it was taken by Henry I.; the second by Stephen ; and the third by the Parliamentary forces under Sir Wm. Waller, in December 1642, when it was reduced after a spirited resistance of seventeen days under the command of Sir Edward Ford, and was then occupied by troops sent from London. This siege was most disastrous to the structure, which was reduced in many places to a heap of ruins by the artillery fire brought to bear upon it by guns placed on the church tower. Dismantled and roofless, it remained in ruins for over seventy years, when the eighth duke partially repaired the fabric, making some part of it habitable. In this state it was visited in 1749 by Horace Walpole, who described it as “now only a heap of ruins, with a new, indifferent apartment clapt up for the Norfolks when they reside there for a week or a fortnight.” But in 1786 the tenth duke began the ” restoration” and rebuilding, which went on until his death in 1815, during which time a sum of about £600,000 was expended, the result being the production of a magnificent modern castle of highly elaborate design and execution, but of no historic interest except in the few spots where the ancient work remains, and with which alone we are concerned. Arundel Castle stands at the lofty edge of a spur of the downs that, running southward, overhangs the river Arun. In early ages the tide flowed up to this cliff, which forms a sufficient protection to the fortress from N.E. to S.E., the range of walls and towers, with a deep ditch on the S., guarding the remaining fronts : the area enclosed is about 5+ acres. The modern castle forms three sides of a large quadrangle, the fourth being occupied by the great circular keep, whose origin may date from a pre-Roman period, standing as it does upon an artificial mound nearly 100 feet above the ditch. It is 65 feet in diameter, with walls 8 to 10 feet thick, having a Norman casing of Caen stone. A fine circular-headed doorway was inserted in it by Earl Roger, who built also the smaller arch on the S., giving access to the well, and the barbican, or Bevis Tower, together with the lower portion of the great gatehouse, sometimes called the Clock Tower, the upper part of which is Early English of the date of Richard FitzAlan in 1295, when the outer gateway was added with its two flanking towers; he also built four towers at equal distances round the enceinte beyond the keep. The ancient chapel or oratory was likewise his work.